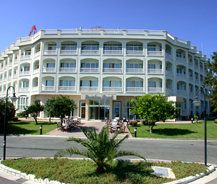 Denizkizi Royal Hotel is designed and built recently with high standards in the lands of Kyrenia. This hotel is just eight miles from Kyrenia and this is built in such a way that it satisfies all guests demand and provides comfort at a best level. It has a direct attachment to beach and pool on its back. This hotel has facilities which all the four star hotels should hold and that includes separate phone lines, Satellite TV, showers, bathrooms, mini bar, fridge and balcony as it is situate on sea shore. The look which you could experience here is the most beautiful and gorgeous one as it is situated between Mediterranean Sea and the Mountains. This hotel is serving people for more than three decades and it has two buildings each with different room categories and they offer various facilities to guests. Like all other hotel this also holds one private beach with restaurant and offers water sport for their guests also in the beach they are allowed to swim as the sea level is very shallow. Other than this it also has an attached swimming pool, a fitness center, heated Jacuzzi, casino especially for adults and dining facilities based on different regions.